Covert - Double Edge 154CM, Serrated. 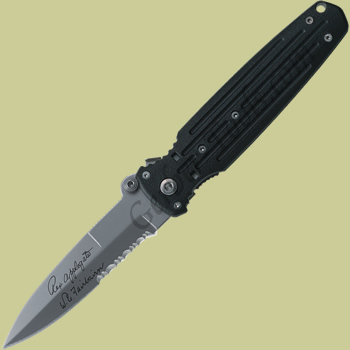 This Gerber model 05785 Applegate Fairbairn Covert has a double edge with one side partially serrated. The blade is made out of 154CM stainless steel and locked up tight with a unique roto-lock. The ambidextrous thumbstuds allow for one handed opening, and the glass filled nylon handle is nice and grippy. Gerber Applegate Fairbairn knives are world-renowned for best-in-class among folding tactical knives.